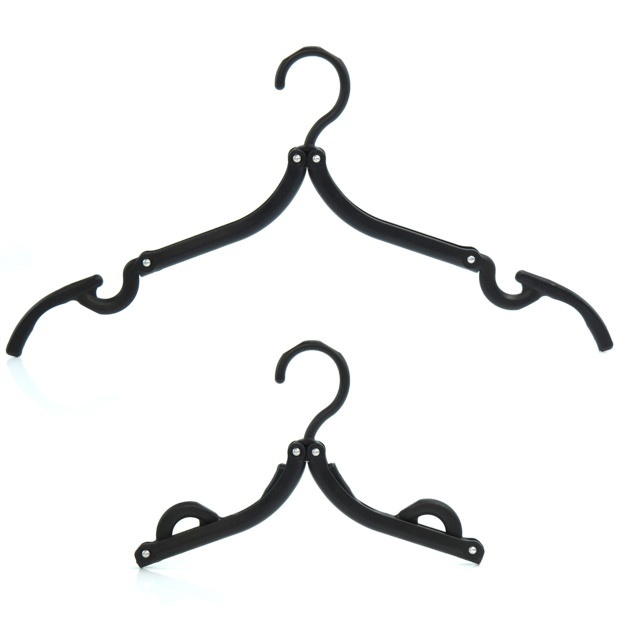 Premium quality black plastic foldable travel clothes hangers. Ideal for hanging shirts, blouses, t-shirts and jackets. Shoulder notches for garment loop sand straps. A perfect travel accessory for use in the car, camping and caravanning. Innovative foldable style, compact & convenient to carry. Size: Width: 40cm (16"). Folded 8cm x 13.5cm (3.1" x 5.3") approx. Absolutely delighted with this product. It wasn't clear viewing online just how small these hangers do fold. With minimal space available in our luggage, they will be an absolute godsend.